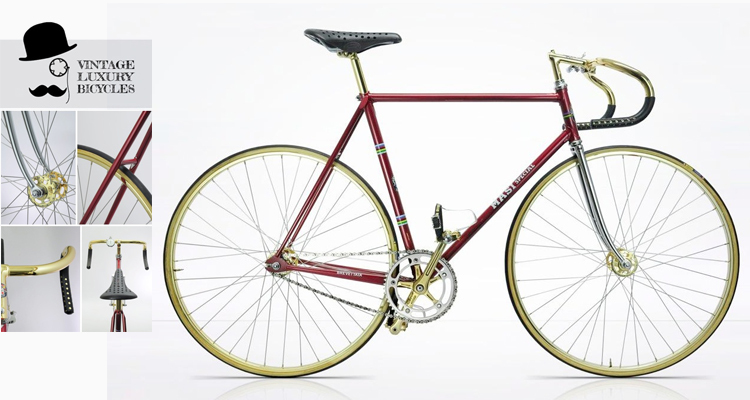 Masi Special Pista with 24K gold plated components! I came across this gem over the weekend. it is the Proteus frame building book. It was published in 1975 by Dr. Paul Proteus, who actually did not exist and was presumed to be written by two of the founders of Proteus. It reminds me of the "Moosewood Cookbook". Across the street from the University of Maryland in 1972, 3 young bike enthusiasts decided to make their own bikes and a booming business was begun. Proteus took a very hands-on, proletariat approach... you could buy a bike frame, or a bike frame kit, or have your kit's tubes mitered by Proteus, or have your bike painted after you made it at home! Proteus also was a prime supplier for building bits and tubing. In all cases, this paperback put in very basic terms what was required to make a ride-able bicycle with simple hand tools. Frames sold by and labeled PROTEUS were made by various employees who changed regularly. Yet highly trained master builders also came & went at Proteus. Perhaps most notable was Koichi Yamaguchi, who went on to have his own workshop in Colorado and build quite a reputation. Some of this text is taken from the classic Rendezvous website. This is an old post card, and on the front is a really cool old bike shop. I am not sure of the exact age, but it is at least 1892. I say that because there is a candle stick telephone on the counter, and those were first available in 1892-3. Note the awesome New Departure bell display next to the phone on the counter. Also of note are the carbide lamps in the display case. That may be an early'ish motorcycle the man is sitting on, I am not sure though. We attended the Butler, PA swap meet this past weekend put on by Rapp's Cycle center and organized by Jeff. This was the 25th anniversary of the show. It was well attended as practically all the vendor spaces were occupied. We showed up saturday night and set up our wares. There was a bunch of buying and selling among the vendors, which is always fun and you get to see what everyone has. This is the first show of the season and is a good indicaton for the shows to come for 2015. This show is nice because everything is contained in the Days Inn. There is an indoor pool , great for relaxing after carrying around a lot of steel bikes! There is also an attached bar and restaurant, again, a nice break and an opportunity for socialization before it is time for business. This is a good family friendly show, if your signifigant others are not feeling the bikes they can go for a swim or relax in the hotel room and watch TV or whatever. WAY better than sleeping in a field! This show is primarily a balloon tire event, but you never know what will show up. One of the rarest bikes ever showed up one year, fresh from a barn and in great shape! It was the Dayton Huffman "Death Bike", everyone who was there still tells the story! We sold some stuff, bought some stuff and had a great time seeing friends and the variety of bikes people brought. The highlight for me was a really nice 1937 RoadMaster with original paint and all the bells and whistles. See photos, It is the green one with the cool twin headlights and rear rack and tail light. It was a successful event and look forward to next year! Enjoy the photos! Nice personalized chain guard on this Fleet Wing. 2 wheel drive system on this mountain bike! Schwinn Paramount tandem very reasonablly priced! 37' Road Master, my personal favorite of the show! Super cool early (80-81) Cook bros. frame and fork! Swap meet regular vendor and friend Biz was unable to attend, so Larry made these full size heads on a stick, so he was there in spirit and handed them out to everyone. Here he is, sleeping in. Former employee's Tom Teesdale frame.